Just about everyone told us that we simply had to go to The Broken Spoke while we were in Austin. The Broken Spoke happens to be one of the most famous honky-tonk bars in Texas, complete with live bands and dance lessons. The only problem? None of us like country music. But we adopted our finest "when in Rome" attitude, and took off to get our honky-tonk on. Bo wasn't feeling so hot after our race that morning, so instead of jumping into the dance lesson, we found a table in a front corner to watch. I have to admit, the blisters on my feet didn't protest that decision. As soon as we settled at the table, an old man in jeans, a plaid shirt, and a bolo tie lumbered over to us and started yakking about a famous piano player that he'd befriended at this very table. He then proceeded to inform us that we'd actually taken his table, but the staff forgot to reserve it for him. He awkwardly walked off and proceeded to talk at anyone that crossed his path. He was back at our table just five minutes later, asking where we were from and telling us awkward cheesy jokes. The dance lesson ended, Two Tons of Steel took the stage, the waitress arrived with my beer, and we settled back to enjoy the music and the fruits of everyone's dancing labor. And then Old Bolo Man appeared out of nowhere and grabbed my hand. "Come on, honey, let's dance!" Now I'm no Dancing with the Stars contestant - I am neither a dancer nor a star - but I had paid enough attention to the dance lesson to know how the basic honky-tonk steps were supposed to go. Mr. Bolo was not honky-tonking. I have rhythm, dadgum it, and I spent an entire song trying to figure out what world Mr. Bolo was dancing in. I failed. At the end of the song, he pulled me over to the (very good-looking) double bass player. "Hey, she's from Washington DC!" My eyes bulged out of my head as I tried to shoot Mr. Bolo a warning look. Telling someone that in Texas is going to make them think I work for the CIA. "Hi, I'm here to spy on you and pretend to dance. Carry on!" The double bass player was not impressed. I slunk back to my seat, where Bo and Amy were giggling at my forced dancing shenanigans. 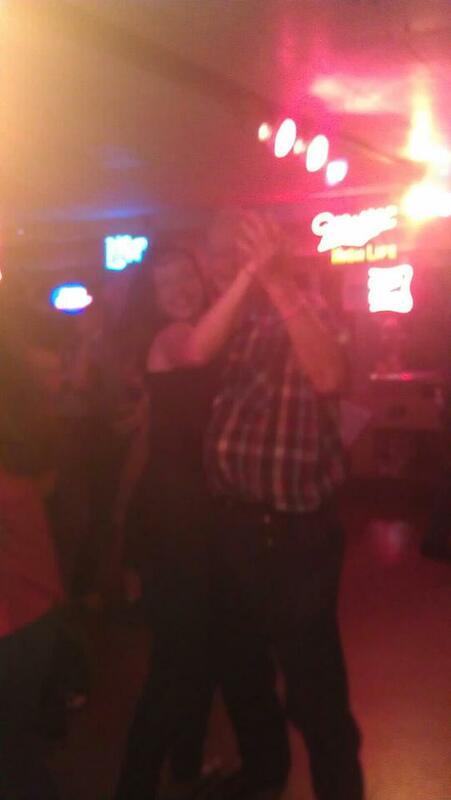 Mr. Bolo gave me five minutes to enjoy my beer before yanking me onto the dance floor again. I finally figured out that he was doing his own version of the two-step. He finally introduced himself as George, said he was 73, and commented jokingly about being able to hold me tight and close. Well, nice to meet you, too, Captain Sketchy. Poor Bo was fading, so we ducked out while he was off working another side of the room. I had begun to notice that the staff tried to escape him whenever he approached. I was actually sad to leave - not because of Captain Sketchy, but because the atmosphere was fun, and the band really was fantastic. I could have sat in my uncomfortable chair with a cold Shiner Bock watching dancers and listening all night. I highly recommend checking this place out, even to anti-country music folks like myself. But ladies, watch out for Captain Sketchy. He's lurking. And he doesn't dance the honky-tonk.